England’s Scott Gregory has defeated fellow countryman, Marco Penge, 1-up to claim the 2017 NSW Amateur Golf Championship at Terrey Hills Golf and Country Club. Gregory, ranked number 10 on the R&A world ranking, needed to dig deep to win the title after seeing his 3-up lead with nine to play evaporate as Penge staged a mini-comeback. Ultimately it came down to one hole and one putt. On the 35th hole, Terry Hills’ 407 metre par 4, Gregory split the fairway with a 3 wood to set up a mid-iron approach to the green. Penge had earlier cut a 2-iron into the right fairway bunker and was in trouble. With the advantage in his favour, Gregory’s approach flew the green requiring a delicate up and down to have a 1-up lead going down the last. “It was a battle for sure,” said Gregory following his victory. 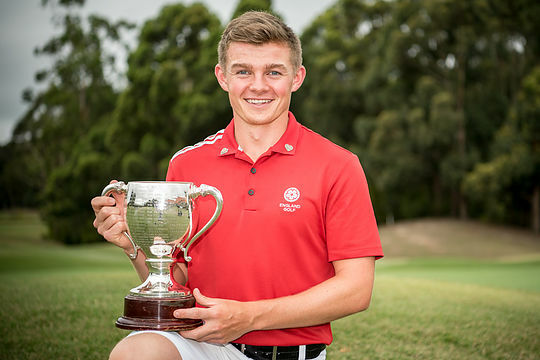 The win caps off a stellar Australian tour for the British team having started with Australia’s highest ranked amateur event, the Australian Master of the Amateurs, followed by the Australian Amateur, Avondale Medal and the NSW Amateur. “It’s been a fantastic tour,” said Gregory, the current British Amateur champion who has received an invite to play the Masters. The all-England final had been set up after Gregory disposed of Australia’s number one ranked junior, Joshua Armstrong, 6&5. Penge had secured his final’s berth with a 3&2 win over 16-year-old Korean, Dongmin Kim. In the women’s final Somi Lee secured the title in a tight match against her Korean counterpart Hye Jin Choi, 2&1. Two weeks ago Lee was defeated by Choi in the final of the Australian Women’s Amateur Championship which sees the women’s series this season in Australia dominated by the Korean team with wins at the Australian Amateur, Avondale Medal and the NSW Amateur.